Surprise! According to my time (CDT), it's still Wednesday, but it's officially Thursday on the east coast, so here we are! The day to Flaunt Your Cause has finally arrived! I'm so excited you're here, and Emily and I are so anxious to see what everyone has to share. Brace yourself for some serious inspiration overload, people! Before I share one of my causes, I have a few words to share with you. for someone who will never be able to repay you." I am so excited to share my experience as a Court Appointed Special Advocate (CASA)! A long-term volunteer opportunity like this is very complex, but today, I want to give you the basics and share a bit about my experience. It may be something you're interested in! A CASA is an adult who is assigned to a foster child in the juvenile dependency system. It is the CASA's responsibility to objectively gather information from key players in the child's life (foster parents, teachers, relatives, biological parents, sport instructors, etc.) and advocate for the best permanent plan. WHO: An adult with an open heart and time to dedicate to a foster child and juvenile court processes. WHERE: Anywhere in the United States! You can search for the CASA program in your area HERE. Organizations that interview, screen, and train CASAs have information and training sessions throughout the year. Similar to starting a job working with children, CASAs must pass a background check and be finger printed. Due to the rotation of training sessions, I had four months from applying to starting training. WHY: There are thousands of children in the system who really need the help of an advocate. We all remember how difficult those younger years were, but imagine being moved from home to home, school to school, never knowing if you'll be adopted or just age out of the system at 18. Their situations are complex, and having an adult who can decipher all the moving parts and simply be a voice for them means that they know they are noticed, heard, and loved. My first "big kid" volunteer job was working as an aide in a preschool for Autistic children when I was 16. After that, every volunteer job I pursued was focused on children. As I got older, I knew I wanted to be a CASA, but I was waiting until I knew I had the time and energy to dedicate to it. 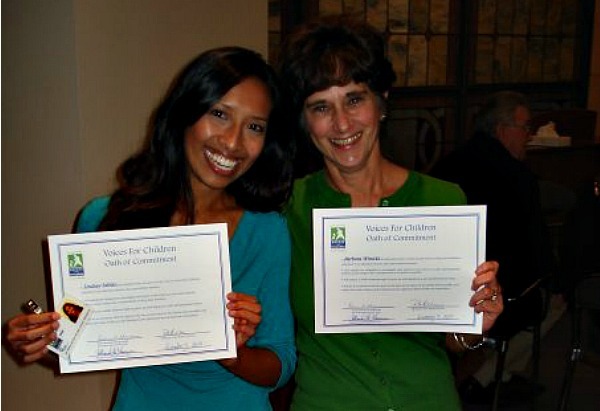 I was a CASA with Voices For Children (VFC) in San Diego, CA, from November 2009 to October 2011. I was assigned to a bright two-year-old who I will call Joy. She was born to two very young parents who were not on speaking terms and in some trouble with the law. During my time as her CASA, I came to know her foster parents (also her relatives), her aunts, her biological parents, her daycare provider, and her preschool teachers. They enriched my life in unexpected ways and taught me more about who I want to be as a mother one day. I was reminded how fortunate I was to have the childhood that I did, but I also learned that love thrives in all places, not just for "picture perfect" families. Joy and I would talk about Elmo, her friends at school, cupcake parties, Tinkerbell, and her trips to SeaWorld. She excelled in preschool. She loved to tell people: "You're beautiful." Appearing in juvenile dependency court is less stressful than it sounds. I attended three court hearings which required three court reports (all reviewed and approved by my VFC program supervisor). Court hearings include only a small group, and it's all behind closed doors. Due to her young age, Joy attended few hearings. Being a CASA stirred new levels of emotions in me. My heart broke for Joy when her father was fatally shot. I was angry when her mom didn't show up for a scheduled visit. I was frustrated when I sat in an important meeting listening to people discuss who should have custody of her and why. I worried that I wouldn't be permitted to stay on her case until the end when I found out I was moving to Texas. (Luckily, I did get to stay on the case for the remaining four months and checked in via phone!) But it wasn't all negative, not even close. I felt loved when Joy thanked me for things. I felt successful when I overcame a few toddler melt-downs. I felt infinitely proud when she was adopted by her relatives who now have full custody of her (and thank me for my hard work every single time I talk to them). I was a busy CASA. I worked a full-time job, did two musical productions, sang for a few other gigs, got married, maintained family and social life, and moved my married life to another state! But it was all worth it. For the sake of confidentiality, I cannot tell you names or show you pictures. In fact, we never took pictures together. I only have her school photos. In two months, Joy will be five years old. As she gets older and starts to understand how her life is "different" from her friends', I hope she will also understand how loved she is and that her past doesn't dictate her future. And just like she tells me when we talk on the phone, I hope she knows that she is beautiful. If you have any questions about my time as a CASA, please feel free to comment below or e-mail me at Lindsay@TrialBySapphire.com. 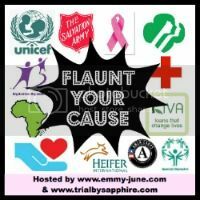 Do you have a great cause to link-up? It's simple! I loved your vlog, especially the line about how some people flaunt their bodies. Pretty slick, my friend. I love reading more about your work as a CASA. It really makes me want to think about that. I can imagine there would be a big range of emotions, but I'm sure they need level headed, rational individuals to volunteer. I have always wanted to be a CASA ever since I found out about them. I haven't settled in one place long enough for that to be something I could reasonably do and be fair to anyone, but it's on one of the first things I plan to do when I finally set down roots! What a beautiful post & story Lindsay! I knew that you were kind & compassionate, but this is evidential proof. Are you going to get involved in Texas & take on another child? For the past few months, I've been volunteering for Girls on the Run, a program that teaches girls about exercise, good body image and self-esteem. At the end of the program, they run a 5K race and ours is this weekend! It's been a really great opportunity for me to learn from the girls in my group...and I hope they've gained a lot from it, too! My boyfriend is an attorney & on the CASA board here. I think it's a great cause! I love this - you are amazing! My neighbor is a CASA and it has been an incredible experience for her. I loved reading about your story. I would love to do something like this one day!!! Dang, that is AWESOME. Those kids desperately need people like you! Not even gonna lie - I have tears in my eyes right now. Lindz...you have one of the BIGGEST, SWEETEST hearts ever. And you inspire me every single day. I than kyou for your hard work, inspiration & constant encouragement. I hope that I impact people as strongly as you have impacted me. Wow, what a great program! Lots of time and dedication, but being an advocate for foster children is worth every second. Thank you for sharing! i love this linkup :) new visitor! This is so great! Today was my first time visiting your blog and I'm lovin' it! I am just not coming across your blog! So sad I missed this day - I have a great cause! Will this be a weekly/monthly thing? While going through college, I was a part of Kappa Alpha Theta and our philanthropy is CASA. Having volunteered at fundraising and advocacy events, I have always wanted to become a CASA. Thank you for sharing your experience. I certainly hope, wherever, my life leads me that I'll be able to partake in such a great opportunity. On a side note, I'm a new reader of your blog and am thoroughly enjoying your posts.